Kumbu allows you to upload pictures (JPEG, JPG, GIF, PNG) and videos under 20 Mo from your Android device. Learn how! 3. 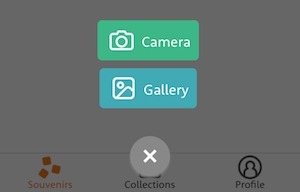 Take picture or choose Gallery to add photos from your camera roll. You need to allow access to proceed. 4. Tap on 1 photo to upload it. Long press a photo to add more than 1, select photos and tap Open to confirm upload. You can upload photos and videos using Kumbu directly in you web browser. 4. Select 1 or more photo and tap Open to confirm upload. Kumbu only supports pictures and videos. If you would like to upload other types of documents, please contact us. Pictures and videos are limited to 20Mo.